Carduus nutans is a biennial herb, 30-150 cm tall, from a fleshy taproot, all parts very spiny. Leaves of first year in a rosette, leaves of flowering stem alternate, to 25 cm long, 10 cm wide, elliptic to lance-shaped, deeply, irregularly lobed and toothed, waxy pale-green, spiny at lobe and tooth tips, leaf bases extending down stem as spiny wings. Flowers pink to purple, all tubular (discoid), heads 3-5 cm wide, basal bracts narrow, spine-tipped numerous; blooming and fruiting June-Oct.
Fruit 1-seeded (achenes) 0.4 cm long, white-plumed. Primarily reproducing by seeds, not vegetatively, seeds viable to 10 years in soil. Seeds generally germinate within 2-3 weeks of dispersal (Desrochers et al. 1988). 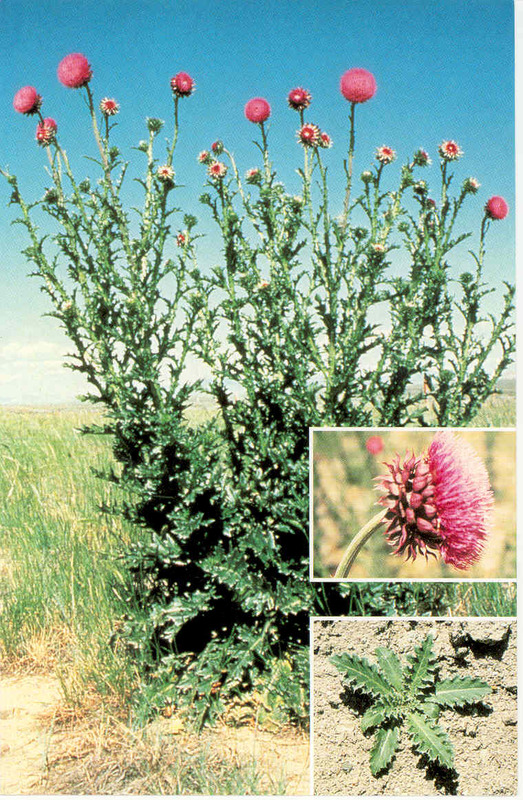 Habitat: Open soil, apparently mostly an agricultural or nursery weed (Uva et al. 1997). Notes: Fed upon by several moths, flies and beetles. Infected by Puccinia carduorum fungus (Desrochers et al. 1988).